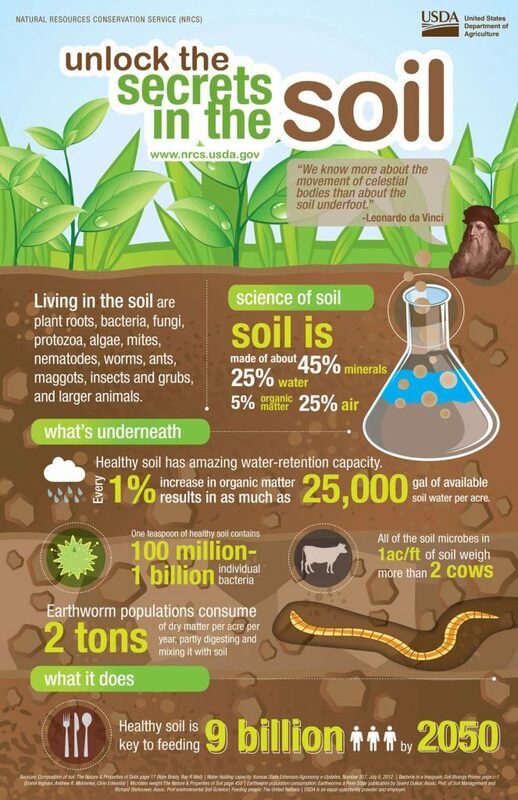 Why is healthy soil important? Have you ever thought about the soil that lies beneath your feet? Soil is responsible for 95% of the food we eat and it supports life on Earth in many different ways. 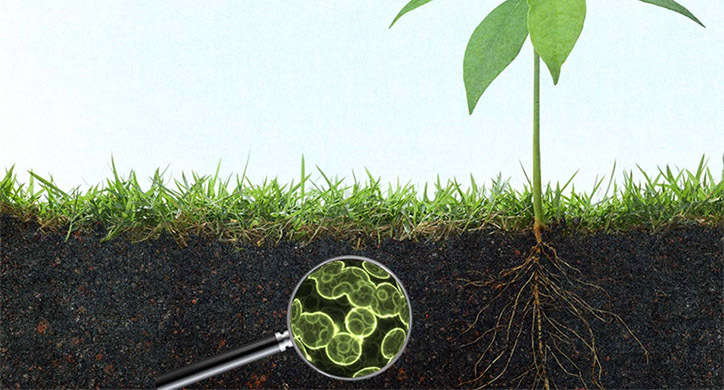 But what exactly is healthy soil and why is it so important? Many of us don’t give it a second look, but without soil (note: we won’t call it dirt) life on Earth simply would not exist! 95% of our food is directly or indirectly dependent on soil. You wouldn’t be eating very well without it! The soil is an essential ingredient to healthy food and nutrition and is responsible for the ripe fruit you eat at breakfast, the crisp lettuce used in your salad for lunch, and the chicken you prepare for dinner. Thank you, soil! 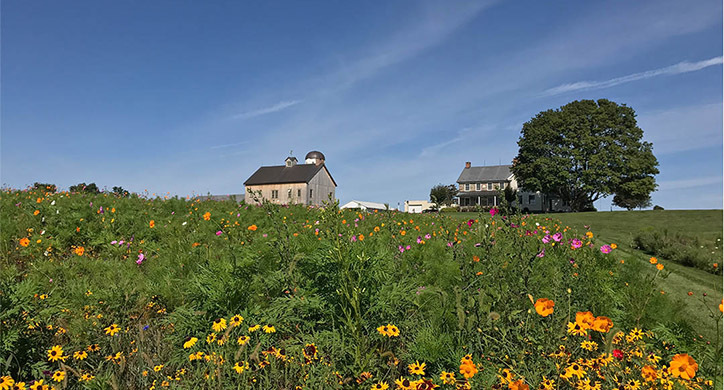 Soil also supports the foundation for our homes, it helps grow the fibers that make up our clothes, provides the fossil fuels that keep our engines running, acts as a purifier for our water and air and helps control both erosion and flooding. 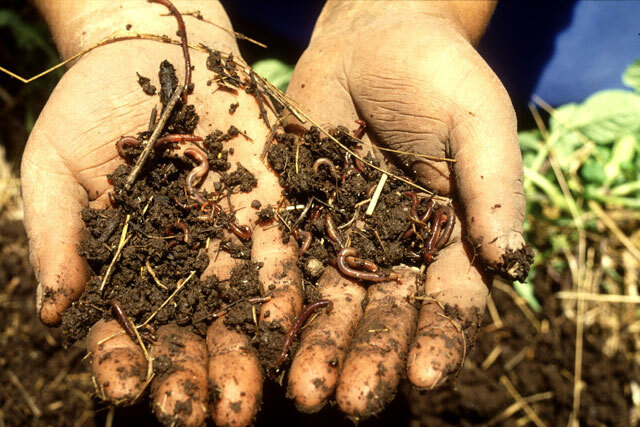 Soil provides habitat for essential organisms and has a big impact on climate stability. (Read more about this in our post, Out of the Air and Into the Soil). 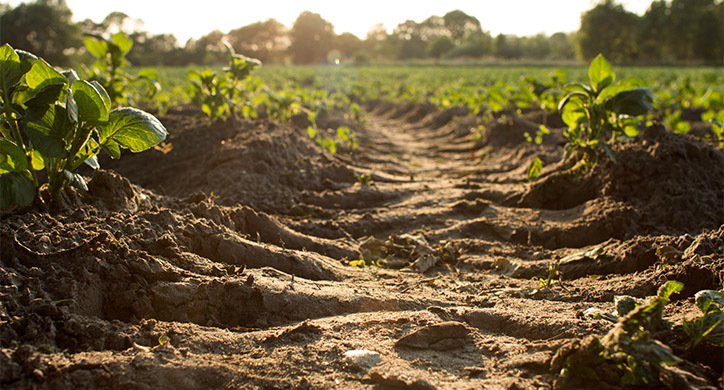 According to the Food and Agriculture Organization of the United Nations (FAO): 33% of the world’s soil is moderate to highly degraded due to erosion, drought, loss of soil organic carbon, loss of biodiversity, destruction of ecosystems, habitat destruction, and pollution. 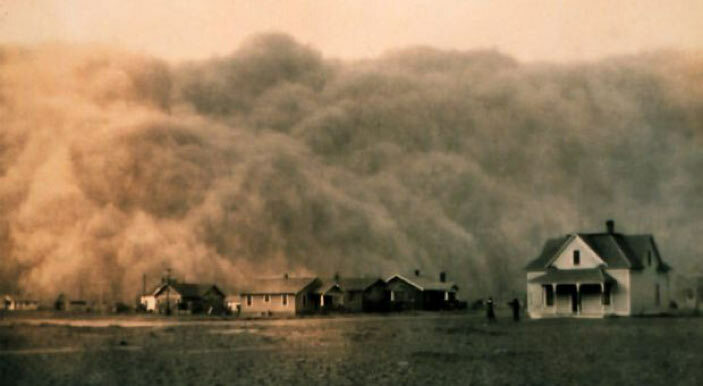 The World Wildlife Fund estimates that half of the topsoil on Earth has been lost over the past 150 years. This is a huge problem! Soil is a finite resource, which means its loss and degradation is not recoverable within the average human lifespan. This is critically important because it threatens our ability to provide food for a growing population and jeopardizes the quality of our environment. 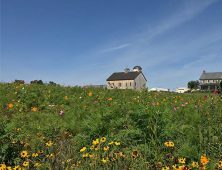 The good news is that there is a worldwide effort amongst government agencies, NGOs, and food and agricultural companies to provide education, research, and funding to farmers, ranchers, and landowners to help improve, manage, and sustain healthy soils. For too long, we have cared too much about what the soil can do for us, and each year it grows a little more tired, depleted, susceptible to pests, disease and water shortages, and we are all responsible. “It is up to us, farmers, ranchers, soil scientists, legislator, and consumers, to invest in our soil once again. Do you grow your own veggies? 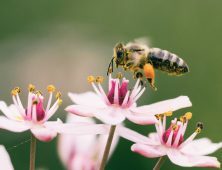 If yes, you know that they grow better and have fewer pests and diseases if they are grown in a soil that is rich in organic matter. Adding composted kitchen scraps, well-rotted manure or bags of purchased compost to the soil supports the beneficial biota living in the soil. 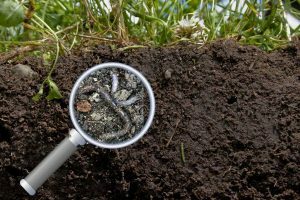 Examing soil: The presence of earthworms is a good sign of soil health! 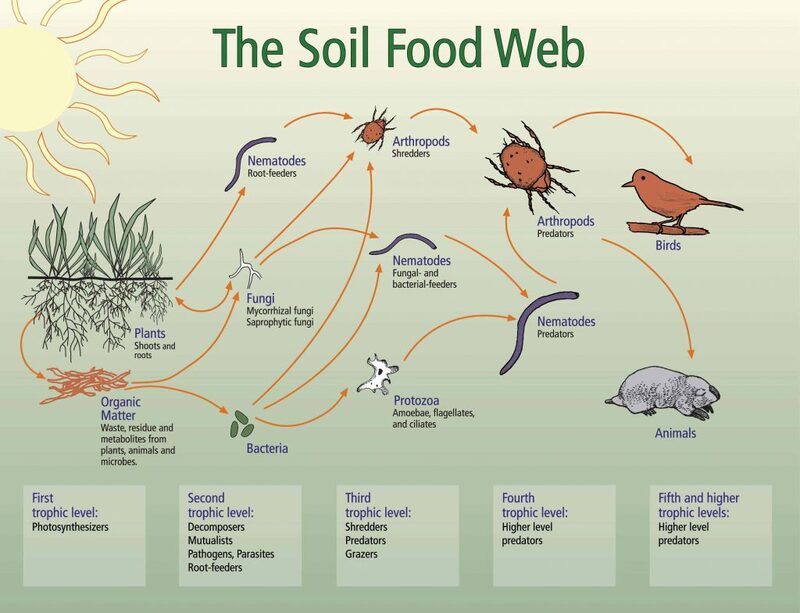 These billions of beneficial organisms–bacteria, algae, fungi, protozoa, nematodes, earthworms, and beetles — feed, digest and decompose the organic matter and in turn improve soil tilth, texture, aeration, drainage, and nutritional content. 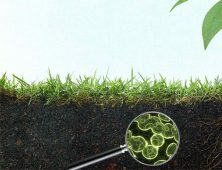 A single gram of healthy soil contains millions of organisms, most of which we cannot see with the naked eye or have even discovered. 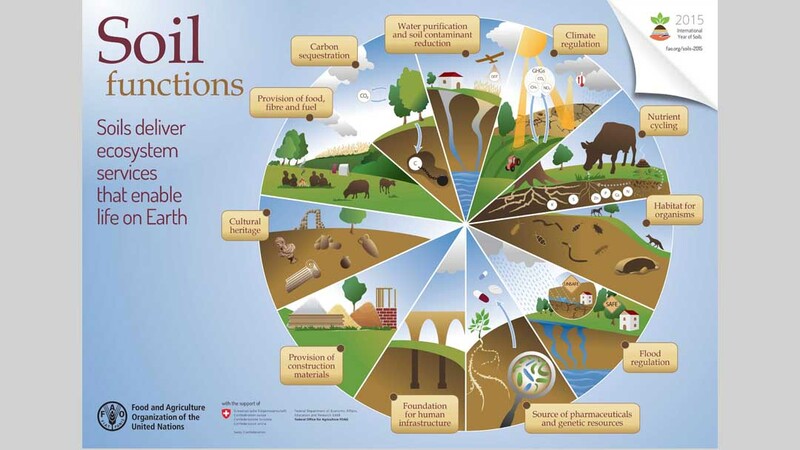 (Photo: FAO) Test your knowledge of soil! Click on the image. By increasing the organic matter in your soil, you can improve its long-term health and performance. Similar to how you can drink and eat pre and probiotics improve your gut health, farmers incorporate organic matter such as crop residues, animal manure, compost, cover crops, and perennial grasses, and legumes to feed the microbial community in the soil. These practices are the basic principles that underpin conservation agriculture. Researchers agree that soil health improves through diversified crop rotations, minimal soil disturbance (no-till and reduced tillage), and the use of cover crops. These practices are the basic principles that underpin conservation agriculture. 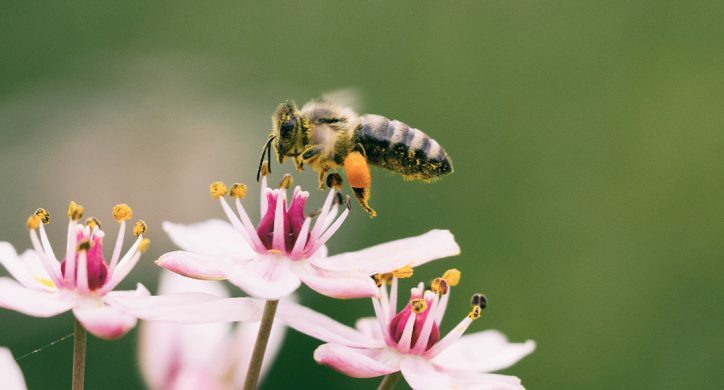 As a result, farmers are sequestering more carbon, increasing water infiltration, improving wildlife and pollinator habitat—all while harvesting better profits and often better yields. The soil is the foundation for our food and well-being. Organic matter is the key to healthy soil, and by incorporating compost, crop residues, aged manure or cover crops into your garden or yard, you will create a strong and resilient soil which will improve the environment around you and grow more bountiful crops.